Top photo: Rector Bassi and President Loh sign the Memorandum of Understanding. (L-R) ISR Director Reza Ghodssi, University of Trento Rector Davide Bassi, ISR Director of External Relations Jeff Coriale, University of Maryland President Wallace Loh, University of Maryland Office of International Programs Associate Director Joseph Scholten. 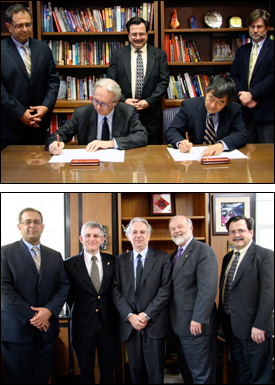 Bottom photo: (L-R) Reza Ghodssi, University of Maryland Vice President for Research Patrick O’Shea, Rector Bassi, Maryland Secretary of State John McDonough, Jeff Coriale. ISR hosted University of Trento Rector Davide Bassi on Thursday, Nov. 3 as he visited the University of Maryland to sign a memorandum of understanding with University of Maryland President Wallace Loh. The memorandum covers research and educational exchanges between the two universities and is part of a broader partnership that also includes the University System of Maryland, the State of Maryland, the Autonomous Province of Trento, the Consiglio Nazionale delle Ricerche, and Fondazione Bruno Kessler. as well as faculty researchers in neural systems, neuroscience and cognitive science, bioengineering and microsystems. For more information, contact Jeff Coriale at 301-405-6604, coriale@umd.edu.